impressed with the friendliness,helpfullness and level of professionalism experienced right from Parts to Service to Reception. Really impressed with the friendliness,helpfullness and level of professionalism experienced right from Parts to Service to Reception. I have just privately purchased a 2006 Mazda5 which had a few small parts replacement issues and this was my first visit to Morrey Mazda North Shore. I love my vehicle & will definitely look at purchasing a newer one in the future. It's a joy to drive and I can finally drive at night again without being constantly blinded by oncoming traffic. 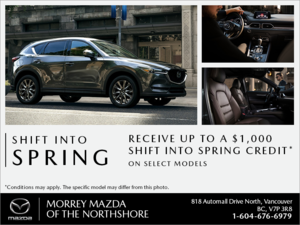 I would like to say the customer service from all associates at North Vancouver Mazda dealership was super awesome.